A view of the art installation "Apollo XVIII," which combines archival NASA footage with new digital work by the artist Marco Brambilla. The exhibit will be on display in New York's Times Square from 11:57 p.m. to midnight, every night in March. NEW YORK — The last Apollo mission launched by NASA was Apollo 17, in 1972 — but an art exhibit called "Apollo XVIII" is launching from Times Square all this month. 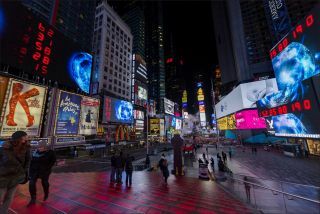 On March 3, at 11:57 p.m., the rain has finally stopped and visitors to New York's Time Square can look up at the massive screens that normally wrap this area in advertisements. For three minutes, dozens of the screens collectively display an art piece called "Apollo XVIII" created by Marco Brambilla that was inspired by space exploration and the work of NASA. A private reception on March 3 celebrated the exhibit's opening. "Apollo XVIII" is a nonlinear video piece, composed of archival footage from NASA mission launches mixed with new, digital images by the artist. Different visuals play on dozens of screens across Times Square. Some of them are distinctly vintage clips from NASA launches; others look like computer-animated segments of a modern-day science fiction movie. Red numbers, like those counting down a rocket launch, are displayed almost constantly, generating a sense of anticipation, although the numbers jump around, never following a regular count down. Attendees of the March 3 reception were also given headphones to wear while watching the display; an equally disjointed set of sounds, including a voice counting down to liftoff and an orchestra playing the U.S. national anthem, added to the feeling of expectancy and excitement. The "Apollo XVIII" piece "is based on the idea of a countdown. It's compressing the idea of space exploration to the moment of greatest spectacle: the 10 seconds before liftoff," Brambilla said. "I've always been fascinated … with the idea of space exploration, both scientifically and the more metaphysical aspects of it in terms of exploring our own limits." While "dozens" of screens compose the entire exhibit, according to a statement from Times Square Arts, the most prominent are four massive screens — two on either Duffy Square, a public space right below where the New Year's Eve ball drops every Dec. 31. The screens are so massive that a clip of a Saturn V rocket leaving the launch pad can be displayed so the size of the rocket is to scale (only a section of the rocket is shown, but the size is still impressive). At the reception, Sherry Dobbin, director of public art for Times Square Arts, the public art program of the Times Square Alliance, described Times Square as a "manmade canyon." The digital screens, normally filled with advertisements, are as tall and as wide as the enormous buildings they cover. "One of the things we're really interested in with this project is how do we transform the nature of Times Square," Dobbin said. "We have the capability to actually make people look up and wonder where they are. And so it seems like a thing to do to actually transport people into outer space." After working with Brambilla on previous projects, Dobbin heard that the artist was doing a commissioned work for NASA (the agency has a history of working with visual artists). She offered Times Square as a venue for the work. "It just seemed very natural to actually have a place where the scale is actually appropriate and respectful for the content that he was exploring," she said. Real NASA events have been displayed in Times Square in the past. Huge crowds gathered to watch NASA land the Curiosity rover on Mars. Astronauts on the International Space Station have wished people on Earth a happy New Year from Times Square. In an interview played at the March 3 reception, Brambilla also made reference to people gathering around the television to watch NASA launch the various Apollo missions. "I love public parks to begin with, and I think specifically for this project, bringing it back into this kind of communal viewing experience really makes the whole project more meaningful for me," Brambilla said. "Apollo XVIII" is part of a series called "Midnight Moment," presented by the Times Square Advertising Coalition and Times Square Arts.